The Blu808 team headed up to Thunderhill raceway in Willows, CA for their annual Thunderdrift February event. 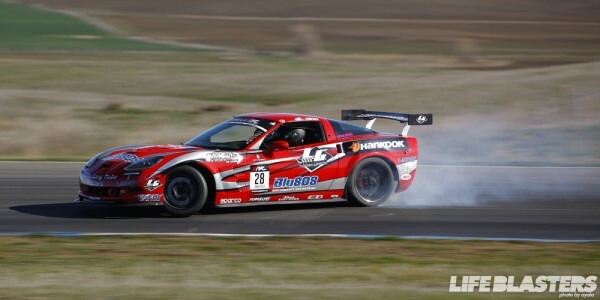 Luke Lonberger was out in the Blu808, LG Motorsports, Hankook tire C6 Corvette. They have made significant changes to the car and are happy to report that they are ready for Long Beach and will have some exciting new sponsors on board for the season opener in April. Tickets are now available for Round 1: Streets of Long Beach on April 6-7, including reserved seating, 2-day ticket packages, and VIP tickets. Tickets can be purchased through http://formulad.com/schedule/tickets/, Ticketmaster outlets, and the Long Beach Convention Center box office. Ticket prices start at $28 online with reserved tickets available for Saturdays competition day. 2-day packages are also available along with VIP ticket packages. Save on additional fees by purchasing your ticket at the Long Beach Convention Center box office directly.